"One U.S. astronaut pitted against all the odds beyond this earth!" This motion picture tells the story of two astronauts on an expedition to take scientific tests of the planet Mars. While on this mission an asteroid comes so close to their space ship that they are forced to eject down to the planet, but only one of the astronauts makes it down. He comes to realize that it is only he and the astronaut monkey with him who are going to be living on this planet alone. Eventually he manages to discover not only a source of extra oxygen, but befriends an alien he calls Friday, and they survive together. 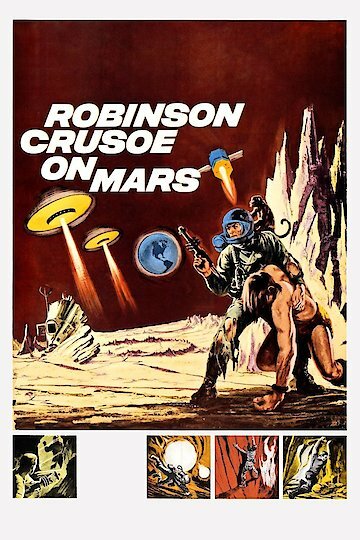 Robinson Crusoe on Mars is currently available to watch and stream, download, buy on demand at FlixFling, FlixFling VOD, Vudu, iTunes, YouTube VOD online.